The Eek! 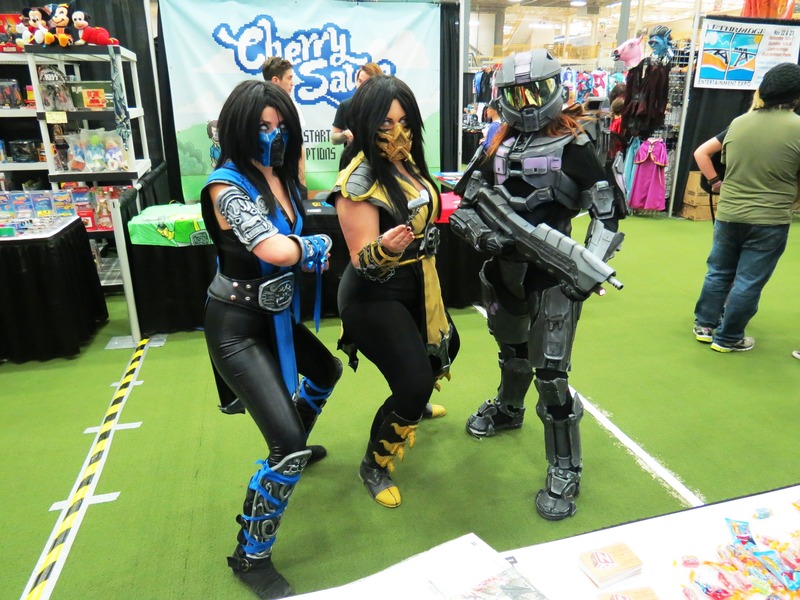 Comic and Pop Culture Festival launched for its inaugural year on May 31 and June 1, hosting two full days of exhibitions, shows, and plenty of shopping for the nerd culture-inclined. 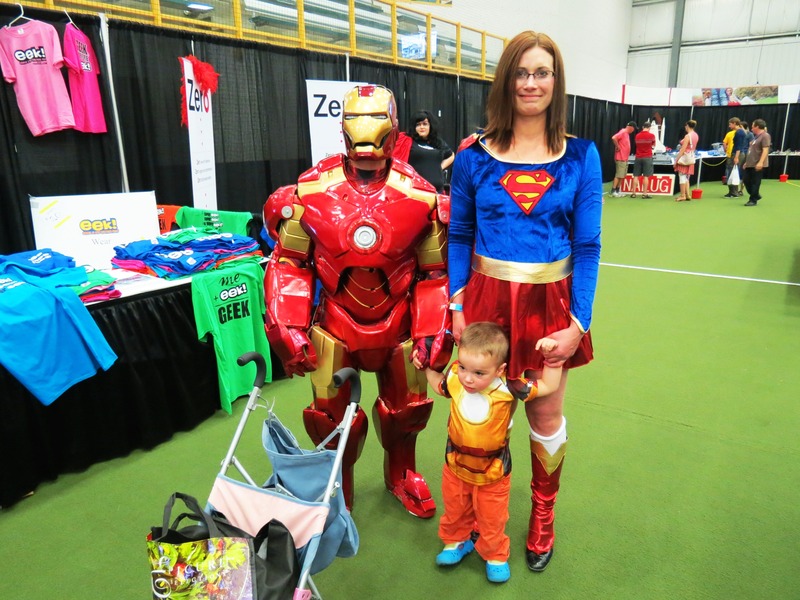 Despite being the first of its name, the Eek Fest drove plenty of traffic to the Servus Place facility in St. Albert, where two halls were dedicated to comic books, Lego, collector items, artists and creators, and much more. The special guest was Stephen Amell, star of CW’s Arrow. Fans who were able to make his Q&A session at Eek Fest were treated to an inside look at the elusive man behind Oliver Queen…and pull-ups, of course. the pulp magazine shared a booth with the Northern Nerd Network this year and, when we weren’t giving away Spiderman candy or convincing people to enter our WIN COMICS contest, we both got the chance to interview a number of artists, creators, exhibitors, and more throughout the weekend. Here are our highlights from the show. Cherry Sauce is a clothing company run by Mike Gaboury and Jason Soprovich, who started the business six years ago. They’ve been doing conventions for about five years now and average around eight to ten conventions per year. The shirts feature incarnations of your favourite classic video game characters with a weird twist, such as Link with a nosebleed, or a zombie Mario kingdom. Both Gaboury and Soprovich keep Cherry Sauce going as a hobby and are regulars at the Calgary and Edmonton Expos. Their first experience at Eek Fest was a positive one. You can also find live streaming and video game reviews from the guys at filthycasual.tv. For goth pastel trinkets and inspired artwork, check out Nikita and Hannah Gushue’s Octopug store, where you can find anything from a Fight Club cameo necklace to tie-dyed winged sneakers. The two sisters come from a background in film, photography, and stage makeup, and they’ve used their creativity to start a business based on their own passions. Nikita and Hannah Gushue recently celebrated their one year anniversary in the business. Eek Fest was their second convention so far. Octopug celebrates the underground elements of pop culture; specifically, elaborate fan art and swag, cute culture, and video game paraphernalia. The sisters are inspired by the pastel goth/pastel grunge culture of the new generation. Kaytlyne Dewald is a mixed media pop culture artist that takes fan art to the next level. 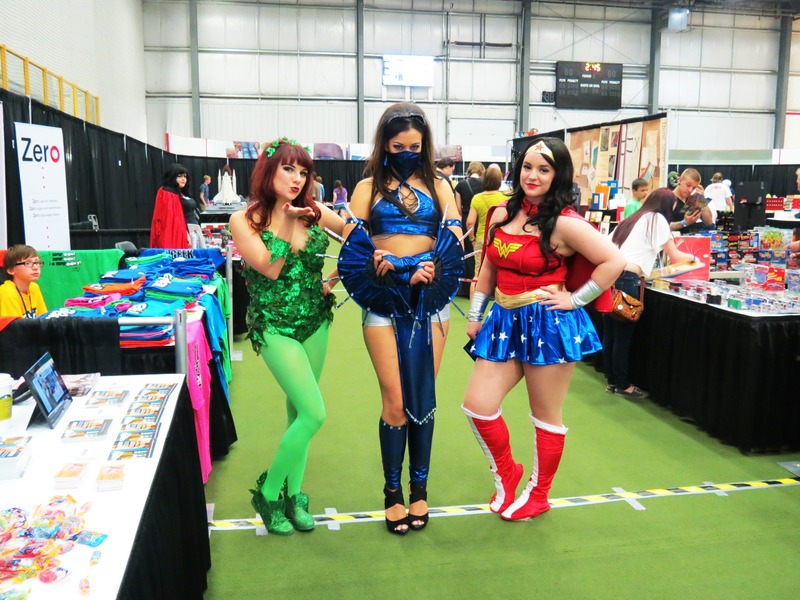 Her booth at Eek Fest was lined with stunning canvas pieces depicting characters from well-known pop and nerd culture media, painted beautifully over a layer of comic book page cut-outs. Dewald has been exhibiting at conventions such as the Calgary and Edmonton Expos for the past two years but has been selling her artwork since the age of 14, starting out at the St. Albert Famer’s Market. 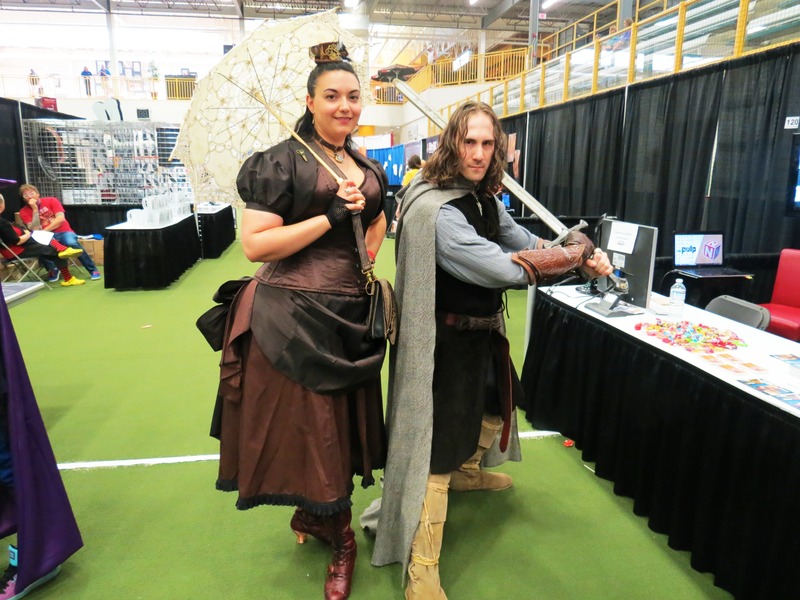 If you’re a comic convention regular in Alberta, chances are that you’ve seen Madame Nadine tightly-corseted up and selling her steampunk jewelry wares. Madame Nadine has been exhibiting at the Edmonton and Calgary Expos ever since she made the move from everyday jewelry into steampunk wear. Her experience at Eek Fest, though quieter than the larger festivals, has been a good one. Madame Nadine’s steampunk designs can be found at the upcoming Saskatoon Blitz and the 2014 Edmonton Expo. Check out some of the show’s cosplayers! Finally, congratulations to Corey Hicks, the winner of our WIN COMICS contest! Have fun with your Happy Harbor swag, Corey.